People who are addicted to cocaine focus obsessively on obtaining and using the drug, neglecting normal goals and satisfactions. Researchers have linked this lost motivation for non-drug pursuits to reduced activity in brain areas that evaluate the results of our actions and determine whether the actions are worth repeating. Now, a NIDA-supported study has found that a cocaine-addicted person’s chance of managing 1 whole year of abstinence correlates with activity levels in these impaired motivational and decision-making brain areas. The study’s findings suggest that more severe cocaine-induced impairment in these brain areas makes people more susceptible to relapse after treatment for cocaine addiction. As a result, functional magnetic resonance imaging (fMRI) of these brain areas might be a useful tool for assessing patients’ treatment needs and tracking their progress in recovery. Dr. Jennifer Stewart, Dr. Martin Paulus, and colleagues at the University of California, San Diego performed fMRI on 30 patients who were starting treatment for cocaine addiction. 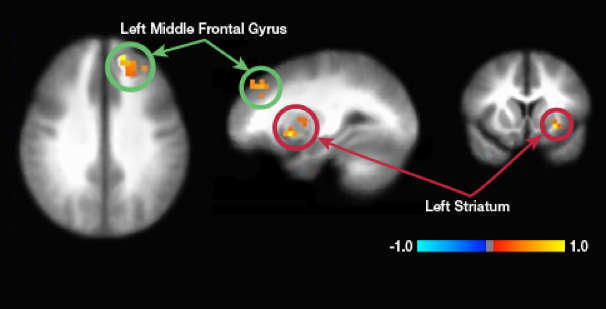 The scans recorded activity in three brain areas while the patients played a computerized version of the game Paper-Scissors-Rock (P-S-R). The scans recorded activity in areas that studies have shown to be weakened in cocaine addiction: the insula, striatum, and prefrontal cortex (PFC). Together, these areas learn to associate actions with good or bad experiences that follow, identify opportunities to repeat the actions and re-experience those outcomes, and weigh the opportunities against the risks of going ahead. To test the vitality of the three brain areas, the researchers modified the traditional P-S-R game to engage these functions (see Figure 1). Each patient played 120 rounds of the game in six 20-round blocks. The computer was programmed to be rather predictable and make the same play—paper, scissors, or rock—90 percent of the time in each block. Thus, patients should be able to readily pick up on the computer’s pattern and, once they did, win 9 rounds out of 10 by making the correct counter-play. The researchers awarded $1 for each round won against the computer and subtracted $1 for each round lost. The researchers also asked the patients how badly they wanted to win. A year later, they re-contacted all 30 patients and learned who had relapsed in the interim and who had not. Figure 1. Paper-Scissors-Rock on a Computer In the study, participants played 120 rounds of Paper, Scissors, Rock, grouped into six blocks of 20 rounds each. In each round, the participants chose paper, scissors, or rock by pressing on a computer key, then saw the computer’s counter play appear on the screen. Paper won against rock, scissors won against paper, rock won over scissors, and other combinations tied. In each block of 20 rounds, participants who noticed that the computer consistently (9 out of 10 times) played the same choice—paper, scissors, or rock—could adjust their play accordingly and reliably win. The researchers compared the participants’ brain activity in early rounds, when they were observing the computer’s pattern of play, versus late rounds, when they had learned and were taking advantage of it. Reported lower motivation to win. Shown no greater activation in the striatum to wins than to losses, suggesting less discrimination between positive and negative experiences. Exhibited less activity in the PFC and insula during the early rounds of each 20-game P-S-R block, suggesting weaker engagement of these areas in the task of forming associations between plays and outcomes. Displayed the same amount of activity in the PFC in early and late rounds of each P-S-R block, suggesting that learned associations were not as quickly assimilated into ready responses. Dr. Stewart and colleagues note that despite their lesser motivation and brain activity, the patients who relapsed notched just as many wins in the P-S-R game as those who abstained. Moreover, both groups’ success rates improved to a similar extent from early to late rounds. Possibly, the researchers say, the differences in brain activity between those who abstained and those who relapsed weren’t large enough to produce differences in success rates in this particular game. Alternatively, patients may have used brain areas to play the game that the researchers did not examine. In sum, activity reductions in motivational and decision-making brain areas distinguish people who are addicted to cocaine from those who are healthy, and this new study suggests that, among those who are addicted, greater activity reductions increase the odds of relapse. fMRI images obtained while patients play a game that engages these brain regions may provide an estimate of their risk for relapse. This study was supported by NIH grant DA018307. NIDA. "Brain Imaging Predicts Relapse to Cocaine." National Institute on Drug Abuse, 14 Sep. 2015, https://www.drugabuse.gov/news-events/nida-notes/2015/09/brain-imaging-predicts-relapse-to-cocaine. NIDA. Brain Imaging Predicts Relapse to Cocaine. National Institute on Drug Abuse website. https://www.drugabuse.gov/news-events/nida-notes/2015/09/brain-imaging-predicts-relapse-to-cocaine. September 14, 2015.